The new retail building was designed to fit into the landmarked streetscape in Chicago's fashionable Armitage-Halsted Historic District. 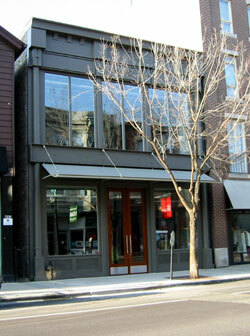 The client was looking for a facade that was reminiscent of classic cast iron storefronts. The result was this graceful all steel assembly set off by a curving canopy made of an aluminum multiply product. The detailing, the date in the middle of the cornice and the respect for it's context won this building the only award in 2004 given by the Chicago Landmarks Preservation Commission for a new building.